World of Warcraft has had vanity pets since the game launched, from the Mini Diablo that came with the original Collector's Edition, to humble stalwarts like the Hyacinth Macaw or Mr. Wiggles the Children's Week piglet, and right up to current Raid boss rewards like the Droplet of Y'Shaarj, all following adventurers around during their quests on Azeroth and beyond. Pets have only gotten more popular too thanks to Mists of Pandaria's addition of Pokémon-esque Pet Battles - but I have a feeling this one might be one of the most popular yet. I may or may not have shrieked like a little girl when I first saw it. 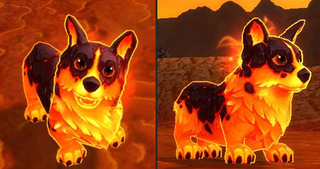 Revealed today by Jonathan LeCraft, Senior Designer on World of Warcraft, on his twitter account, the Molten Corgi will be making its way to the game soon ™. No other details were revealed - such as if the pet will be attainable via an in game task, given away as part of a promotion, or if it will be a pet that goes up on the Blizzard Store, but who needs to sweat about the little details when you've got this guy? WHAT. A. CUTIE. If this lil' rascal is a Blizzard Store pet, I may have to break my solemn vow to never purchase a pet or mount from the store. I'd also need to resub to the game, too, while I'm at it. 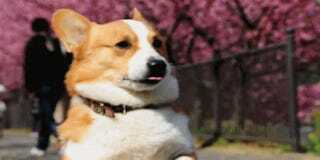 The things one would do for corgis.